It might seem like all the good news is coming out of downtown and Cleveland’s near west side neighborhoods these days, yet North Collinwood and St. Clair Superior are two east side neighborhoods that are seeing redevelopment activity. Now, both neighborhoods are approaching exciting, game-changing phases of their renewal with the Hub 55 project in St. Clair Superior and the revitalization of East 185th Street at North Collinwood’s eastern edge. From the Cleveland Flea to a 2013 ArtPlace grant that facilitated Upcycle St. Clair, from the innovative Urban Grazing Program to the now-annual Kurentovanje Festival, a spurt of new ideas and funding have recently flowed into the St. Clair Superior neighborhood. Now St. Clair Superior CDC, the nonprofit group that serves the area, has received an $800,000 grant from the U.S. Department of Health and Human Services for the creation of a healthy foods market on East 55th as well as healthy food education outreach programs. Further east, Northeast Shores CDC was recently awarded $45,000 for ActiVacant, a program to recruit entrepreneurs to vacant retail spaces on E. 185th, through the Neighborhood Solutions program of Cleveland Neighborhood Progress (CNP). The group also plans to renovate the long-vacant LaSalle Theatre into a multi-use arts production facility and practice space. “I am hopeful the project will spur a variety of development that not only complements existing businesses ... but also paves the way for innovative and distinctive development that makes East 185th a highly buzzed-about destination,” says Colleen Gilson, Vice President of CDC Services for CNP. From the Beachland Ballroom & Tavern to interesting public art, funky businesses and tons of art galleries, there’s no place quite like the Waterloo Arts District. But there’s a lot more going on in North Collinwood than just this creative hub. E. 185th is North Colinwood’s longstanding retail and restaurant hub, but in recent years it’s been plagued by vacancy. Accessible off I-90, it is less than two miles east of Waterloo. Northeast Shores Community Development Corporation is launching ActiVacant to help incubate three to five new businesses on 185th and reopen the LaSalle Theatre. Northeast Shores has been a part of the community for 21 years and serves North Collinwood from E. 140th to E. 200th. Long before there were dining options on Waterloo, E. 185th provided a retail hub for 22,000-plus mixed-income residents that live within one mile. 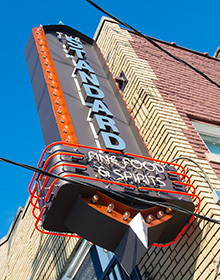 It’s home to The Standard — an upscale comfort food joint that occupies the old Harland Pub -- Chili Peppers, Bistro185, Scotti's Italian Eatery, Chill Pop Artisan Popsicles and Cleveland Brewery, which distributes beer to the Standard and plans to open a tasting room. The area is also home to Villa Angela-St. Joseph High School and healthcare institutions — University Hospital, the Cleveland Clinic, Hospice of the Western Reserve, and Slovene Home for the Aged. Nearby are a number of parks including Euclid Beach, Wildwood Park and Sims Park to the east in Euclid. Northeast Shores is working to encourage ownership on E. 185th St. and Waterloo. Within the past five years, Waterloo has experienced stability and an increased number of businesses. As a result, a number of artists are ingrained into the larger residential fabric of neighborhood and the culture of the neighborhood overall has become more creative and artistic. “We are obsessed with ownership," says Jack Storey, Business Development Specialist for Northeast Shores. "The reason you can feel that artists and business owners are truly invested in the neighborhood is that generally people aren’t renting or leasing their spaces. In most cases these artists own these spaces. That’s been a huge push for us to ensure that the neighborhood isn’t disingenuous or manufactured." ActiVacant is an initiative to transform empty spaces and make them available for below-market rental rates to entrepreneurs. Northeast Shores is working with landlords to secure vacant spaces and “white-box” them so future tenants can finish them out. ActiVacant treats brick-and-mortar startups the way that incubators do tech startups -- the program represents an intentional effort to create a thriving, connected community of entrepreneurs. For retailers, it offers an incentive program to locate here, including a tier-based rental structure. Northeast Shores CDC has owned the historic LaSalle Theatre for over five years and plans to reopen it in 2016. The Neo-Classical theatre was built in ’27 by the International Savings and Loan Association and it included their bank branch, retail stores, apartments and the theater until it closed in the 1990s. “We are nearing the fundraising goal we have for developing LaSalle Media Center," says Friedman. "This is going to be a music and video production facility available for various creatives in Northeast Ohio. It will be the largest [public] production facility in Northeast Ohio. In addition to that it will have various storefronts and apartments on top." Northeast Shores has set a fundraising goal of $3.2 million dollars.They received $675,000 in federal and state historic tax credits and are still seeking $500,000. The LaSalle is a 40,000-square-foot building and its theater is acoustically suited for large choirs and orchestras. The space will not house a single tenant. Instead, it will be redeveloped as a multipurpose communal work and practice space for performance artists, bands, dancers, theater troupes and special events. The venue’s primary income source will come from rental fees, Friedman says. If you attended this summer’s Cleveland Flea, then you visited its popup location in the parking lot of Sterle's Country Home on East 55th Street. While you were there, hopefully you ate a kielbasa or drank a mug of beer. After decades of gradual decline, the St. Clair Superior area may be on the rise again -- and Rick Semersky, owner of Sterle’s and the 200-employee VIP Construction Company, has become a major player in its revitalization. Semersky, whose firm specializes in historic renovation, bought the 60-year-old ethnic restaurant three years ago and is now working on creating Café 55 in an adjacent building. He also plans to open the 10-barrel, 75-seat Goldhorn Brewery in late spring. 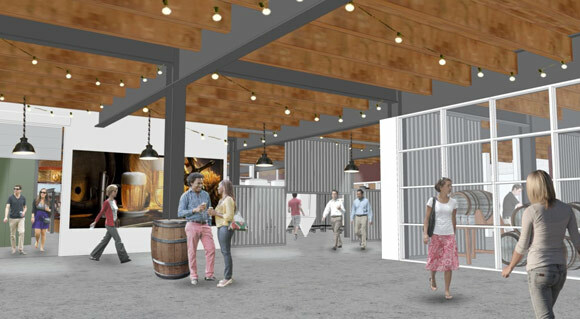 The final phases of the project will include a 12,000-square-foot market with locally sourced food vendors and artisans, slated to open before the end of 2015. Semersky moved VIP Construction from North Collinwood to St. Clair Superior in 2004, and then moved the company to a larger space on the same block. The current Hub 55 project will be housed in VIP Construction's former offices. Hub55 is actually a series of buildings that previous owners combined with brick facades along 55th. Semersky is working to install all new windows and will also clad part of the building in metal panels, a very industrial look that will blend well with the more traditional facades. The overall plan is to combine the two properties (Sterles and the Hub) with a pedestrian plaza. Semersky feels a sense of loyalty towards the area. His father’s side is Hungarian and Croatian and his grandmother grew up on Bonna Avenue just a stone's throw from Sterle’s. E. 55th used to be home to many Cleveland’s breweries and Hub 55 actually sits on the property of Cleveland’s first neighborhood beer garden. “It really goes back to the stories my grandma used to tell me, that when she lived there the neighborhood had everything that you needed within a few block radius. I wanted to put everything back into the neighborhood in a much more updated fashion,” he says. Cafe 55 is a 1,500 square foot restaurant that will be operated by Cleveland chef Jeff Jarrett. Semersky and Courtney Bonning of Ohio City’s Bonbon Pastry & Cafe created the concept together and she is a consultant on the project. “Cafe 55 is really going to be the first healthy, quick, accessible new restaurant that’s been in the neighborhood -- it’s breakfast, it’s lunch, its grab-and-go with a focus on local, nutritional foods,” said Semersky. Cafe55 will feature made-to-order breakfast and lunch sandwiches. It’s slated to open in March and its hours will be Monday through Friday from 7 am to 3 pm. Joel Warger will be Goldhorn’s head brewer and will manage the tap room and kitchen component. Warger is currently the Pub Brewer at Great Lakes Brewing Co., where he has gained 14 years of experience. Semerky wants the taproom to have a neighborhood bar feel to it. It will feature traditional beers such as lagers, pilsners, ales and Hefeweizens, sticking with the Eastern European history of the area the breweries that used to line 55th Street. The area was deemed a food desert because it lacks a true fresh-food grocer within a half mile radius of its residents and suffers from a high density of health disparities including diabetes, hypertension and obesity. SCSDC hopes this food hub will help create employment opportunities and offer healthy food choices. “Just by putting food in the area doesn’t solve the problem because it doesn’t change behavior," says Michael Fleming, executive director of St. Clair Superior Development Corporation. "We’ve dedicated a portion of the funding to create engagement with residents about food and food entrepreneurialism." SCSDC will bring in neighborhood and local vendors for pop-up weekend kiosks at the market. The idea is to use the market as an incubator to help get small businesses off of the ground. There are also plans to include a community kitchen that will be modeled after CornUcopia Place in the Central neighborhood. “Part of St. Clair Superior’s role is to use the building as a portal for education," says Semersky. "We made a world where it’s very fast, easy and convenient to go to a lot of other places like fast food restaurants — we want to give people the opportunity to re-train themselves on how they eat, shop and feed their families." Fleming has already noticed a shift within the neighborhood. “The most meaningful part of being involved in the Hub55 project has been watching attitudes change," he says. "In a few short years, we’ve seen people go from feeling like they’ve been suffering from a steady decline and now we have federal support. We’ve seen people’s attitudes shift toward that of possibility."